1.1 Applicant received Notification of Examination Results via email from BCM Institute’s Certification Department after the respective qualifying examination. Please note that certificates for these level of courses are NOT given automatically upon completion of course. All application steps have to be adhered to before application can proceed to the review board. 3.1 Certification Review Committee will review the application and review applicant’s experience with references. 3.2. Applicant received notification on result of certification application. 3.3 Successful application receive certification award package from BCM Institute. Unsuccessful application may receive an alternative certification award package. 5.1 Member must continue to practice BCM, DRP and any other related disciplines. 5.4 Member received acknowledgement of submission and receipt of Annual Maintenance Fee. 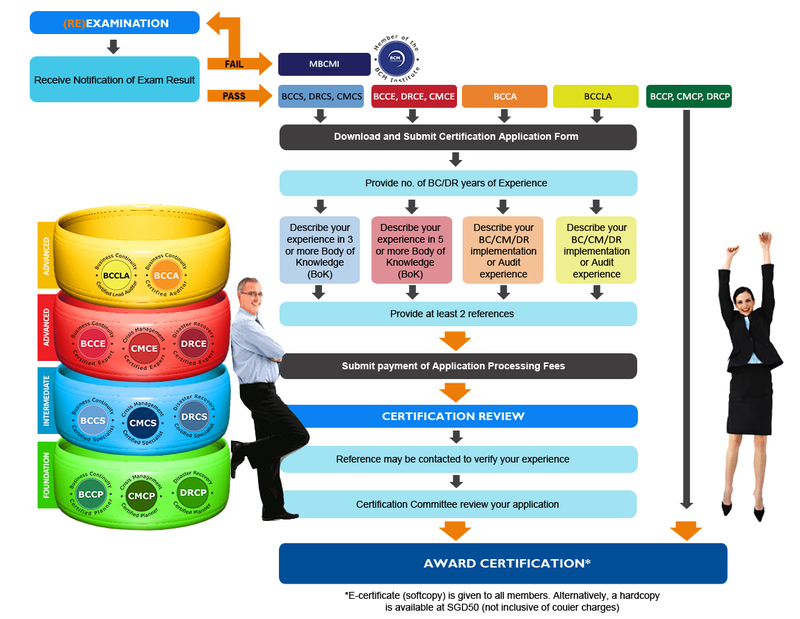 All participants for expert level courses must complete any 5 out of 7 Body Of Knowledge (BOK) explained in detail for BCCE/DRCE/CMCE certification. All participants for specialist level courses must complete any 3 out of 7 Body Of Knowledge (BOK) explained in detail for BCCS/DRCS/CMCS certification. All participants for audit courses must explain in detail the work experience in BC or Audit for BCCA/BCCLA certification. Sample document as a reference for filling up the application form.